This Alexander model twin villa is fully furnished and features approximately 1,700 sq. ft. under air. This home has two bedrooms, two bathrooms, living room, dining room, den, and kitchen with eating area. 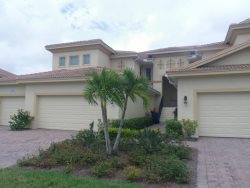 The home also has a screened lanai with heated pool and heated spa plus a two car garage. The master suite has a private bathroom with shower, double sink vanity and a spacious walk in closet. This home has preserve views. Social membership is available.The owner has purchased a new 40" glass top patio table and four chairs. They have also updated the bedrooms with new valances, comforters, shams, pillows and lamps. These new upgrades are not reflected in the pictures on the website. They have also installed new vertical blinds in the livingroom. Colonial Country Club features a championship golf course, a full service clubhouse and recreation complex. The clubhouse has a dining room, a grill-room, a snack bar, fitness center, a library, meeting room, massage rooms, golf pro shop and activity center with a full time director. Colonial has eight lighted Har-Tru and two hard surface tennis courts. The 18-hole championship golf course was designed by Gordon Lewis with an aquatic driving range and putting green. Colonial Country Club is conveniently located off Colonial Boulevard, an east-west thoroughfare near Interstate 75. A few miles west you'll find Lee County's favorite beaches, including Fort Myers Beach, Sanibel Island and Captiva Island.